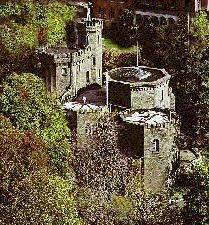 Fonthill was built in Riverdale, the Bronx, N.Y., from 1848 to 1852 for the actor Edwin Forrest and his wife. Before they could occupy the castle, however, divorce proceedings interrupted their lives and the castle was sold to the Sisters of Charity, who still own it today. It is now a part of the college of Mount St. Vincent. Fonthill was named after the castle of William Beckett in England, Fonthill Abbey. The design of Mr. Forrest's Fonthill Castle has been attributed to Thomas C. Smith of New York City. The castle, dramatically sited above the Hudson River, is one of a few survivors of the many castles that used to line the Hudson River, but were lost to developement. I currently attend the college of mount saint vincent and the castle currently houses the admissions and financial aid departments. Mostly everything appears to be intact...the floors in each room have interesting wooden floor patterns and the doors are extremely heavy wooden doors. It is really interesting to look at and I begin to wonder about what it might look like without the desks and computers. It would make such a beatiful and cozy home.